We took this action to bring attention to the billions of animals enslaved for their milk, eggs and flesh. 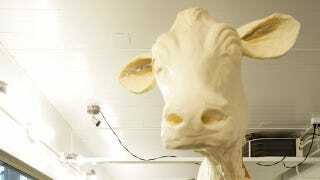 The butter cow represents humankind's tyranny over defenseless animals. The sign only stayed up for about two hours, and the cow was unharmed. The tyranny continues.